Post your weather summaries for Feb 2016. First 2/3rds of the month was consistently warm to hot without any extreme spike days. Brief cool spell mid month saw high temps only in the mid 20's. A hot spell near month's end saw highs close to 45C. Nights were notably cold, with a massive 15 nights under 15C at the official airport station (which is 10km out of town and in a flat prairie without vegetation so heat radiation is significant there). Nights were noticeably milder here amongst the river network and irrigation close to town suppressing nocturnal cooling. Most extreme example of this was the 22nd, when the airport had a low of 17.7C and my PWS 23.9C. Some thundery activity developed on the afternoon of the 23rd which resulted in a few brief light showers with large drops with a concurrent temp of 41.8C on my PWS, but not enough to register in the gauge*. Overall, a very warm, very wet and gloomy month. Rijeka, a place renowned in Croatia for the amount of rain it gets, had its wettest February ever with about 410 mm and above 500 mm in the suburbs. 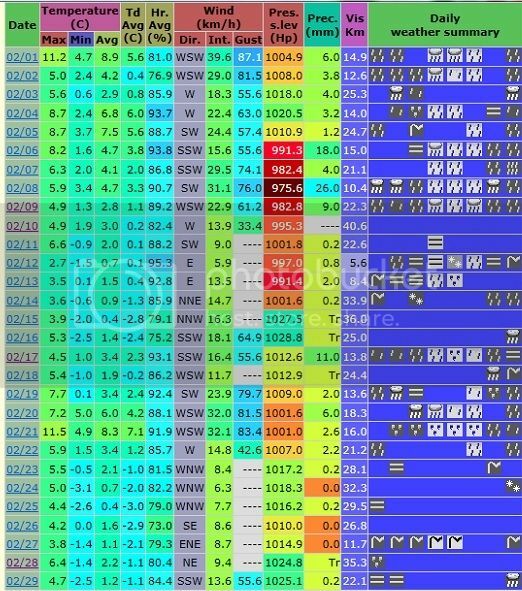 Last edited by Joe90; 03-01-2016 at 01:06 AM..
Like the sun and rainfall numbers! You-know-who will be having a nervous breakdown! I can't be bothered adding all those temperatures up, but nearby sites were very close to average so we will have been too. Rainfall was 102.8 mm, which is 35% above average, and sunshine (I don't get my local figures for a while, so I usually do Leeming's figure minus 10%) was just under 90 hours, or 30% above average - roughly as much as November to January put together. I wasn't actually here until the 28th, but judging by the figures there must have been a very different feel to the month after the 9th when the extreme Atlantic-dominated spell finally came to an end. Late February is often much more benign than the months before it in stormy winters, so even though it's still cold it feels more like pre-spring than a continuation of winter. I looked up some statistics for our prolonged wet and stormy weather this autumn/winter: in the 105 days between 28 October and 9 February we had 829 mm of rainfall (average is around 350-375 mm) on 85 days (using a 0.3 mm threshold) and 54 of those days had gusts of at least 60 km/h - probably our most unsettled period on record, and almost certainly the mildest period between those dates on record as well. I'd definitely have to think about moving if every year was going to be like that. February was a very bleak month here.